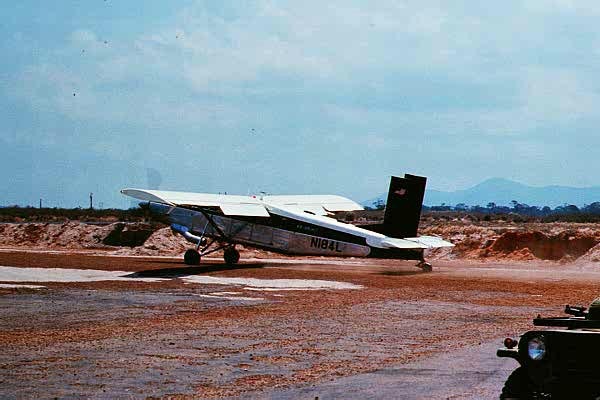 The Pilatus Porter, a Swiss-made aircraft, was one of the more amazing flying machines to be found in Vietnam. It was mostly operated by Air America and had the distinction of having the shortest landing and takeoff runs of any aircraft short of a helicopter. It had a large three blade prop and a very beefy turboprop engine. It could get off the ground in what seemed like a run of about three times its length. Run up to takeoff power, it could lift its tail off the ground without rolling. I once was demonstrating the proper short field technique to one of my students at a field in the Delta and landed a Caribou in the 200 feet from the end of the runway to the first taxiway exit. As we turned off, a Porter was taxiing in behind us. I don't think he thought we would make the 200 foot turnoff and tried to ace us into the parking area by landing directly behind us. My only hope is that his underwear was unsalvageable.